The New Tombstone Cemetery - It Isn't Boothill! The Tombstone Cemetery is the actual cemetery for the town of Tombstone. The way it came into being is involved with the history of the Boothill Cemetery - the old Cemetery in the Tombstone city limits. We live in Tombstone, and moved here early in 2016. But we've visited this historic town for years, because we love it here. We love old Western history. We found the Tombstone Cemetery quite a while back. We thought one day we'd roam it, and investigate it more. But it took moving here to actually do that. Our house is in the Tombstone city limits. Originally built in 1946. Bill looked up research, trying to finding its history. 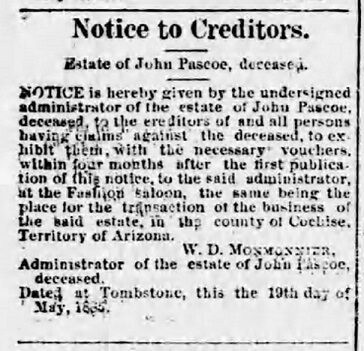 He discovered the first owner is buried in the Tombstone Cemetery. We planned to pay tribute at his gravesite once we got settled. We have a suggestion for you, on learning about this cemetery. Check on Boothill's history first - if you don't know that yet. It's quite interesting. It's also the basis of why this burial memorial ground got its start. The local citizenry's burial grounds is to the West of town - but not far out. Allen Street is divided into East and West sections. The dividing point is the intersection of Sumner Street, which as it heads off and curves West, turns into Charleston Road. As Allen Street approaches town and points East - it's East Allen Street. After you head West on Allen Street, and pass the Sumner intersection, it becomes West Allen Street. Go that way to access the Tombstone Cemetery. Go out West Allen Street, down and up the hill - you'll see the cemetery on the left. It's only about a half mile from Sumner. Tombstone Arizona's reputation was growing for its mining claims. As such, its population grew. With the influx of miners came the support population. By 1880's end Tombstone had 5 hotels and 18 various types of alcohol establishments - most of which ran gaming. There was also a shooting gallery and a bowling alley. Two newspapers were being regularly published. The Tombstone Social Club had been started and the Sixth Street Opera House (also known as the Fontana Dance Hall) was open. Importantly the Tombstone School District was begun. The population was around 2000. Over the next year the population doubled. Tombstone elected their first official mayor, John Clum, under the newly formed city government on January 4, 1881. Recently designated Cochise County was pressured to give the city a charter. It was accomplished on February 21, 1881. The first city laws were enacted. As Tombstone's population continued to grow, homes were going up throughout the area. This home building began closing in on the area of the Old Cemetery - Boothill. The town government decided it needed to address the issue. The City fathers found property for a new graveyard on the town's Western outskirts. It would be the town's fourth designated site for burials. Once the land was obtained, and a plan formulated, it was time to close the Old Cemetery. It was officially closed on May 31, 1884. The City of Tombstone plotted out this New Cemetery on what was then called the Benson Road. Today, you'll find this road is the Western extremity of Allen Street. The Tombstone Cemetery encompasses acreage on the South side of the road. It's also the route to the monument for the person who is famous for Tombstone's establishment. The road to the Schieffelin Monument, which also holds his grave-site, turns off West Allen Street. The first person buried in the New Cemetery was James Lamb, buried on June 30, 1884. The town also organized a transfer of some that were in Boothill to this new Tombstone Cemetery. That happened over the next number of years. These were the good days in Tombstone when the cemetery was being well maintained. Sadly - it's not quite the case even now. Then the mines began to fail for assorted reasons. Economic pressures were felt in town. The grave-sites began to suffer from neglect. 450 bodies from the County Hospital were interred in an unmarked grave. The Great Depression, population decreases, business closures all hit the town hard. During those times, funds for maintenance weren't much forthcoming. A lot of grave markers were lost. If you walked the cemetery in 1947, at the end of WWII, it was a sad sight. There were as many unknown, unkempt graves as marked, cared-for sites. But it's unfortunate that it still has nearly that same feeling. In 1930, Boothill Cemetery had a major clean-up to attract tourists. This helped ensure the new town cemetery would also get its due for local funeral needs. But the Great Depression stifled funding for maintenance of this new cemetery. Attention revived after WWII, when more people moved to town and a new optimism arose. In the early 1950s interest in reviving the town's history awakened. People began to see the value in attracting tourism. Town pride then helped keep their own citizen's cemetery in good repair. That lasted for some time. Today it's officially named "Tombstone Cemetery." It's open daily, and has a large parking area. Take a stroll through, and you'll find some recognizable names. Early Tombstone pioneer, John Escapule was buried here in 1926. He was a miner, rancher, and prime business owner in early Tombstone. Of French Basque heritage, he emigrated to the U.S. in 1876 when he was 20 years of age.1 The Escapule family has an entire area for their plots. The grandson of Cochise, Chief Nino Cochise, the son of Taza, is also buried here. The Tombstone pioneering family, Ethel and James "Bert" Macia are also interred here. Their family are the historical owners of the Rose Tree Inn - which now houses the Rose Tree Museum. It's home to the largest Rose tree in the world! Worth a visit! Their descendants still own the historic building, but now have it up for sale. There is a newer section to the cemetery. It's located to the West of the older areas. A new pavilion was built there, and dedicated in September of 2017. We'll hope the City will show some concern. The Town needs to take some pride again in the Cemetery for its own citizens. The Pavilion was a start. But more could be done. When you roam the cemeteries of other cities, you can see the maintenance and care provided. The Tombstone City mayor should take the lead in this. 1 Bailey, L.R. (2004). Too tough to die: The rise, fall and resurrection of a silver camp; 1878 to 1990. Tucson AZ: Westernlore Press.